It wasn’t to long after I received my Hostgator.com tattoo on my neck, that I was searching for the next website to advertise on me. I googled tattoo advertising and came up with Leaseyourbody.com. This is a website where people can create a profile, list what areas of their bodies they are willing to advertise on with temporary tattoos, and for what price. Companies if interested then contact people via leaseyourbody.com. 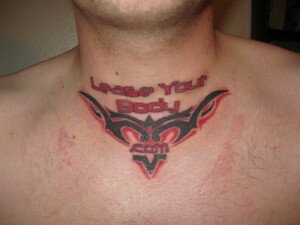 I emailed the owner of the site, and as you can see from the photo now have Leaseyourbody.com tattooed on my neck. It turns out the owner of leaseyourbody.com owns several other websites and will be advertising them on me as well in the future. It was at about this same time the Anchorage Press contacted me about doing a follow up story on me. They had done a story on me a few years ago, they now wanted to follow up, I said sure.The story they did on me can be found at the link below.